These Mixed Jasper Earrings are just what the outfit fairy ordered. These Mixed Jasper Earrings are just what the outfit fairy ordered to make your outfit pop. 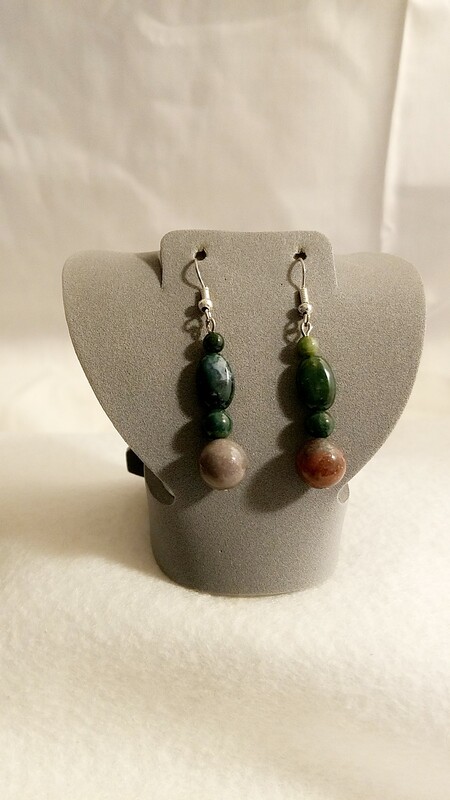 These Mixed Jasper Earrings are just what the outfit fairy ordered to make your outfit pop. Made from varied shapes and types of Jasper one of which is Fancy Jasper which has swirling lines of many colors. This pair of earrings will match many different outfits that you may have because of those varying colors. Jasper - a form of chalcedony, is an opaque, impure variety of silica, usually red, yellow, brown or green in color; and rarely blue. The common red color is due to iron (III) differentiations in what is basically a Chert. The mineral breaks with a smooth surface and is used for ornamentation or as a gemstone. 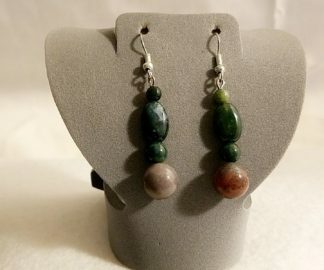 There are many forms of Jasper this pair of earrings uses fancy. Fancy Jasper- varied solid and blended colors, and can display an array of random characteristics including swirling lines, subtle spots and fleck accents. Typically fancy Jasper is an opaque blend of earth tones--forest green, dark honey brown, rich mauve and more--that may be subtly mottled with cream and accented with gold flecks. Fancy Jasper is a stone of gentleness and relaxation. It is professed to enhance one's ability to relax and bring tranquility, comforting, wholeness, healing, and gentle endings. As with all jaspers, it is also a good protection stone. Please Note: Crystal properties and color meanings listed on this site are for information purposes only. Always consult a physician for proper medical treatment. 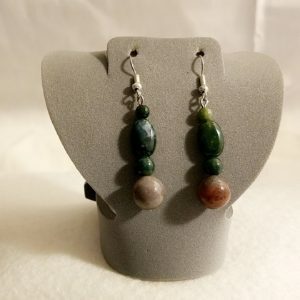 If you would like to know more about the gemstones, rings, and items that are used in making handmade items like this, Mixed Jasper Earrings; please take a look at the Material Description Page and my Chain Maille Descriptions page. Let these Mixed Jasper Earrings make your outfit pop.